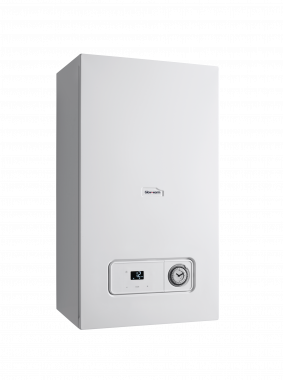 Glow-worm’s Essential 24kW Combi Gas Boiler is a highly reliable unit that offers many features and benefits. With an output rating of 24kW, this boiler is perfectly suited to homes with one bathroom that don’t have such a high demand for heating and hot water. Also available with an output of 28kW it can also meet the needs of medium sized homes too. The Essential 24kW comes with a high efficiency rating of 93% which means that it has an ErP A rating. As a condensing wall mounted boiler, it’s been designed as a lightweight unit that’s simple and offers a smart design. Despite being lightweight, it’s still full of many features including an in-bult analogue timer, a modulating grundfos pump that helps to reduce your energy bills and an easy to use interface with LCD display that’s easy to read, helping to give you maximum control of the unit. It’s also been fitted with a high quality and powerful aluminium heat exchanger. As this is a Combi boiler, it’s a water heater and a central heating boiler wrapped into one, so there’s no need for a hot water cylinder which helps you to save space in your home. With this highly reliable unit being a boiler that features a three year warranty as standard you can be sure your getting a reliable boiler that is not going to let you down.